We’re very pleased to be launching our shiny new website, and we hope you’ll agree it’s a big improvement. 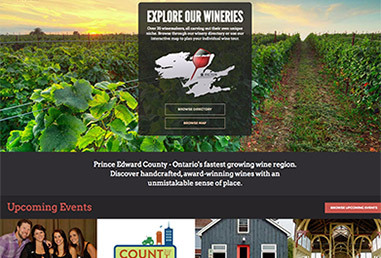 Aside from updating the design to something a little more modern and fresh, we’ve also added a ton of new content, features & functionality to help you explore Prince Edward County wine. You’ll now be able to browse profile pages for each winery, complete with hours, tasting fees and full lists of the varieties of wine they offer. Plus some gorgeous photos and interesting tidbits about the history of the winery and the winemaker. You can also use our interactive map to browse wineries and create a personalized wine tour itinerary (complete with directions) that you can print. Narrow down your options and find exactly what you’re looking for by using the filters to select the types of wine you enjoy the most. Or, find wineries that are dog-friendly, have a restaurant, or are sustainably farmed. You can also find nearby accommodations, shops, and attractions to help plan your trip. Also new, is an Events section featuring upcoming wine-related festivals & events in Prince Edward County and beyond, including events at the wineries plus winemaker’s dinners and other special events. Last but not least, we’ll be blogging regularly to take you behind the scenes and keep you up-to-date on the latest wine news and events here in Prince Edward County. We hope you’ll take the time to check out our new site and let us know what you think in the comments below. Cheers!